Is it possible to positively influence the learning path of children and adolescents working on their capability to understand and manage emotions? 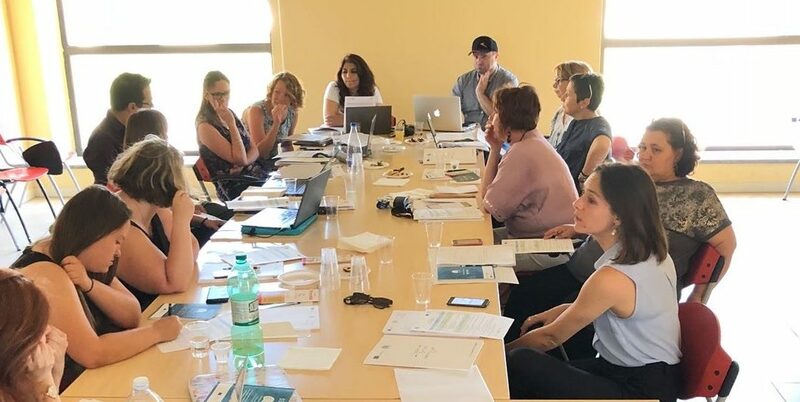 In conclusion of 3 years of shared work, the partners of the project EUMOSCHOOL – Emotional Education for Early School Leaving Prevention met in Viterbo, Italy on July 8th and 9th 2018 to take a look on the results achieved by the project. During the meeting, the project’s partners had the occasion of retracing all the project’s steps, analysing the results achieved, sharing the experiences of this last year implementation in schools and evaluating its impact. Each partner has illustrated the initiatives undertaken at national level to disseminate the project’s products and exploit them, promoting – thanks to them – the integration of emotional education into the scholar curriculum. Finally, they reflected and planned potential further initiatives and future projects to continue of the project’s path and assure its sustainability. With 80 teachers from more then 50 schools in 5 different countries, trained on the topics of emotional education and on the Didactics of Emotions techniques, and with more than 110 students involved in total in the implementation of these techniques for the improvement of their emotional and transversal competences, the EUMOSCHOOL project has developed tools and resources to support students and teachers, with the final aim to create a positive learning environment and contribute to the prevention of early school leaving. These products and resources have been presented during the project’s final conference, which took place at University of Tuscia, within the National Festival of Education, in its final day of Sunday, the 8th of July 2018.
the EUMOSCHOOL OER (Open Educational Resource): A self-learning OER adapted from the Didacticts of Emotions (DoE) for teachers, accessed via Moodle (moodle.org). Guidelines for EUMOSCHOOL implementation as an holistic approach to Early School Leaving: a document in two versions – digital and printed – which sum up the experiences of students and teachers implementing the project’s activities, with a step-by-step guide for introducing the Didactic of Emotions in the classes. Policy Recommendations: a document to guide policy-makers and other relevant school stakeholders in their ESL strategies at a local, national and European level. some teachers from Romania, who talked about their own experience with the implementation of the techniques in their classes, the impact on their students and the feedbacks of these last ones. The project will end on August, 31st. All the products are freely accessible on the project’s website eumoschool.eu.